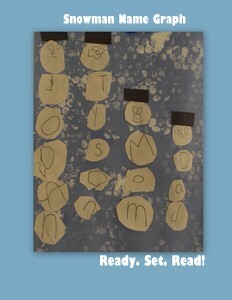 Jake's 100th Day of School Lester Laminack is one of my favorite 100th day of school books! Jake's class is celebrating the 100th day of school. Everyone in the class is bringing a collection of 100 favorite things. Jake creates a book of 100 memories. On the 100th day, Jake forgets his book. His sensitive principal, Mrs. Wadsworth, helps Jake to solve the problem by donating 100 of her books. The day goes on with fun activities, snacks, and even a superific surprise visitor! In the end, Jake uses his problem solving skills to find a great use of his book of 100 memories that he left at home. 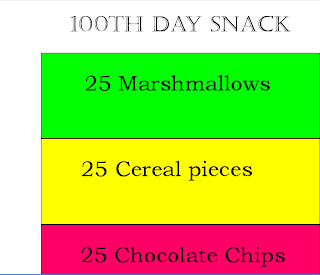 In the story, Jake's class creates a 100th day snack by combining 4 sets of 25 items. We created this 100 snack in the same manner. We made a trail mix snack of 25 marshmallows, 25 cheerios, 25 chocolate chips, and 25 Teddy Grahams. I created a free printable for our recipe! You could modify this to meet the math skill you are covering. For instance, if you want to focus on counting by 10s, you could show 10 sets of 10 items. Do you have any favorite 100th day of school books? This post is part of my mathematically speaking Mondays series. Reading recipes is a great way to integrate math and literacy! Check out Snowman Name Graph which is another fun way to integrate math and literacy. Last year my daughter took 100 shells for her 100th day of school. The teacher invited all the kids to bring 100 objects of the same kind. I wonder when her 100th day is this year? Hmm. Will have to find out. Those books sound awesome! I love the 100th Day! I don't think the class I am in right now is celebrating it though. I haven't noticed anyone keeping track of the days. Next year, when I have my own class, I'll remember these books! Sounds great.Thanks for linking up to Book Sharing Monday.I am sharing this post twitter and FB.